Incandescent light bulbs aren't the most energy-efficient bulbs, but they are the originals, and for most of the 20th century, they were the only ones that were commercially available. Incandescent bulbs produce light by resistive heating of a filament enclosed in an oxygen-free glass container. Before Thomas Edison produced the first commercially viable bulb, other people had been working on the design for over 40 years, and development continued throughout the early 20th century. Although Thomas Edison's name has become almost synonymous with the invention of the light bulb, he wasn't the first person to develop one. British chemist and inventor Humphry Davy was the first person to connect wires to battery and cause a filament to glow. In 1841, Frederick de Moleyns made the first light bulb by putting a platinum filament inside an evacuated glass tube and passing electricity through the filament. Edison and Englishman Joseph Swan simultaneously produced bulbs that lasted longer than a few minutes. Edison's bulb was more successful because he created a complete vacuum inside the bulb and he used a better filament. Edison tried many materials before he settled on using a strand of carbonized bamboo for a filament. He adhered the strand to the electric terminals with carbon paste. Swan, on the other hand, made his filaments out of Bristol board, which is carbonized paper. It lasted only a few hours, while Edison's filaments lasted for 600 hours or more. Metal filaments were introduced in 1902, and tantalum was the material of choice until William D. Coolidge figured out how to make ductile tungsten in 1908. Coiled tungsten wires made the bulbs brighter than ever before, and they continue to be the standard for incandescent bulb filaments. The filament burns up in an oxygen-rich environment, so it's important to eliminate that gas from inside the bulb. De Moleyns and Swan managed to create partial vacuums, but Edison created a true vacuum by heating up the bulb before he pumped the air out. Maintaining a vacuum in the bulb makes it fragile, though. Five years before Edison made his first long-lasting bulb, Canadians Henry Woodward and Matthew Evans had patented light bulbs filled with nitrogen. Irving Langmuir, an engineer working for General Electric, introduced the idea of filling the bulbs with a mixture of argon and nitrogen in 1908. These gases equalize vapor pressure inside and outside the bulb, and argon prevents the tungsten filament from wearing out. Modern bulbs contain mostly argon. The first bulb that Edison made had a pair of terminal prongs at the the base, but he later developed the Edison screw, which is the familiar screw base that's on modern bulbs. Joseph Swan's brother Alfred introduced the glass insulation material that lines the inside of this screw base in 1887. Besides introducing the idea of filling the bulbs with inert gases, Langmuir also developed the coiled filament, and Toshiba Corporation improved on his design by introducing the double coiled filament in 1921. By coating the glass inside the bulb with powdered white silica to diffuse the light, Marvin Pipkin created the "soft light" incandescent bulb in 1947. Deziel, Chris. 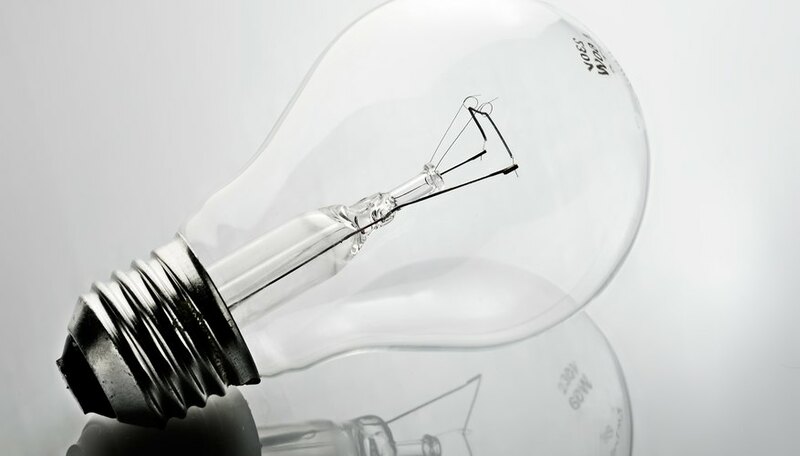 "How Has the Incandescent Lightbulb Changed Over the Years?" Sciencing, https://sciencing.com/lightbulb-changed-over-years-5631574.html. 24 April 2017.